We told ourselves last week, that we were going to try to give a better effort to getting our workouts in on the days they are scheduled instead of playing catch-up. In particular Sunday’s long run and Tuesday’s track. Those beginning of the week runs set the tone for the rest of the workouts, and we have found that if we don’t start off right, it shifts up all of our workouts and creates more fuss. So today was makeup Monday–we had a tired husband Sunday morning, someone stayed up too late watching movies, maybe? ;). It’s alright though, we don’t get too worked up about it,–life goes on, and we reschedule. He needed his rest, and we both enjoyed our lazier Sunday. But man, Monday is tough. It was extremely humid today, the air was heavy on us and we’re planning for 10 miles, but I finished at 7, and Eric put in those last few. I haven’t sweat this much all summer. It was a steamy before-the-sun-came-up workout. On to breakfast and coffee! YES, I will run for coffee. 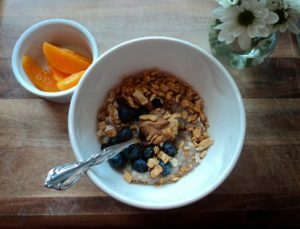 Ooey gooey steel cut oats topped with blueberries, kashi crunch cereal, and raw old fashioned oats with a side of orange slices. Hit the spot for sure. 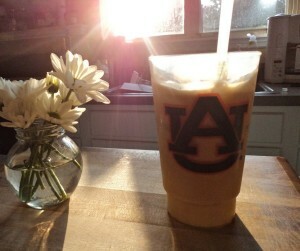 And of course a fabulous cup of coffee–iced latte with soy milk. Delish. Off to shower and work. Those are awesome tips and I thank you, but what are good healthy meals on the go? I move alot each year and I’m in every place at least 4 months or less each time I move. I have very few pots and pans to cook and buying the processed foods are the easiest for me. Planing the meals each week is a great idea and I will try that next week, but its hard to choose what to pick, to ration it correctly and not let the food spoil either. If you could give great advice on that, I would be very happy! Thanks for the comments Thad. Eric and I are on a tight budget as well, with him in school and me just finishing/without full time employment. We have found some things that work for us and help us save 1. Plan meals for the week 2. Make a list of items you need so that you aren’t tempted to by extra things 3. Buy whole seasonal foods. 4. Shop the sale items, when we buy our cereals it’s normally with they have a sale–we refuse to pay outrageous prices too. Healthy foods have been given a bad wrap as more expensive but I disagree, “chips and cereal are almost $5 each!” so if you buy your fruits and vegetables AND your processed foods then YES I’d agree that’s expensive. Thanks. If you can, try to find a recipe that could be use on a budget. I want to eat healthy, but it is very hard to do that on a very tight budget. If you could find one for next week or whenever, that would be amazing! Great to talk to you too! That’s awesome that you are having fun with your workouts. I try to post recipes/meal ideas a few times a week. Hope you find some that you enjoy. Great to hear from you! Wow Kristina! I didn’t know you had food blog. This is perfect, I needed a place to find good recipes for my diet. I have been on a workout routine for the past 2 months and so far I have lost 17 lbs. This will be good motivation to try these recipes. Do you post a new recipe each day?